iPhone 6 has an immersive 4.7 Inches LED-backlit HD widescreen. A brilliant resolution of 1334 x 750 Pixels let you have a wider and clear view of the content. The multi-touch display with a brilliant color contrast of 1400:1 delivers rich and enhanced view.. Explore more on Apple iPhone. Check out other mobile phones and latest smartphones with excellent features & technology. 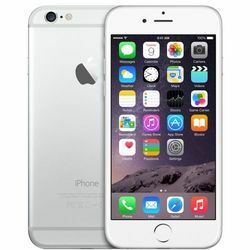 Explore the unlimited features and have a gorgeous experience with the new Apple iPhone 6 which is simply more bigger and more powerful.Bigger Than BiggeriPhone 6 is not just bigger, it is getting simpler in every way. It is getting more sleeker and yet more thiner and slimmer. It has an alluring smooth metal surface that works perfect with Retina HD Display. It is has an ideal amalgamation of hardware and software which has resulted in a new generation of smartphone.At its Largest & ThinnestFrom a streamlined metal profile to the flawless transition of glass, every detail has been crafted with maximum exquisite. It is only 6.9 mm thin with a larger and even more advanced display meant to provide you best view from all the possible angles.Not Just a Bigger Display, A Better DisplayiPhone 6 has an immersive 4.7 Inches LED-backlit HD widescreen. A brilliant resolution of 1334 x 750 Pixels let you have a wider and clear view of the content. The multi-touch display with a brilliant color contrast of 1400:1 delivers rich and enhanced view..Hugely Powerful & Enormous EfficientApple iPhone 6 is comprises an A8 chip which is built on second-generation 64-bit desktop-class architecture. The fabulous and robust M8 chip enhances the power of the device that measures the activity from sensors with the help of a barometer.A8 Chip, High PerformanceThe new A8 chip is more quicker and faster, it allows you to execute multiple tasks easily. It is designed to be more power efficient and deliver a power-packed instant performance. You can play high graphic-intensive games or can enjoy high frame rate videos for a longer duration without any hassle.Two Billion Transistors StrongA8 uses an cutting-edge 20-nanometer process. The rich, small and dynamic chip have the capability to deliver two billion transistors in a more efficient way.M8 Co-processoriPhone 6 is equipped with M8 motion co-processor, it measures the data through gyroscope, barometer, compass and accelerometer. It even measures your steps, changes in elevation and total distance covered.Metal Raises the GameiPhone 6 is committed to deliver you the best in performance and enjoy greatest graphics performance with the A8 chip and iOS 8 Operating System. It is introducing a completely new technology that that let the developers to create highly immersive console-style games on iPhones. The metal is customized in a a way that it allows GPU and CPU to work in coordination so that it can deliver a more detailed and complex visual effect. With the new technology the imaginary world looks more realistic.The Power Behind Our Most Powerful CameraNow capture your precious moments and save them for whole life with the new 8 MP iSight camera. The iSight camera comprises of an Apple-designed video encoder. It has some advanced features that adds to the beauty of image like enhanced noise reduction, face detection, focus pixel, continuous autofocus, and many more. The auto HDR brings a clarity and exact color reproduction in the image.Great Battery LifeNow enjoy unlimited surfing, calling, music and lots more on your iPhone 6 as the phone has a built-in Lithium-Ion battery which is going to be incredibly efficient. It delivers you a longer talktime and standby time too.Explore more on Apple iPhone. Check out other mobile phones and latest smartphones with excellent features & technology.Apple has again made a bang with the launch of Apple iPhone 7 and Apple iPhone 7 Plus! Yes, the features like water resistant and dual camera has already left the smartphone world wide-eyed! You need to buy one to experience it yourself!